Worlds Collide is the solo project of guitarist and keyboardist John Eargle. 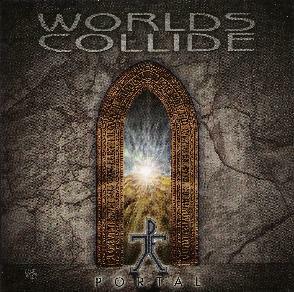 Portal is the first Worlds Collide release. This particular version is a re-release of the original album that first came out in 1998. John’s style is a blend of symphonic progressive rock, with touches of ambient and smooth jazz and a generous helping of orchestral styles of music, especially film soundtracks. Although all instrumental, Eargle is inspired by spiritual and science fictional themes and sources, including C.S. Lewis’ Space Trilogy on at least two of the tracks, the complex orchestral Ransom’s Theme and the acoustic guitar driven Perelandra. John doesn’t really rock out in the sense that his music never gets too aggressive or heavy so I hesitate to actually call it progressive rock, but it’s not so mellow as to be classified as easy listening or new age either. An apt comparison would be David Arkenstone or perhaps Vangelis, but with more guitars. While the music may not be challenging enough for some prog fans, it is nonetheless quite melodic, majestic and moving. Okay, I admit, Portal didn’t quite take me on the musical journey I think Eargle was trying for, but that just may be where I am musically these days. Had I heard this in 1998, when it first came out, or better yet, in 1991, when I was heavily into David Arkenstone and Vangelis, it probably would have blown me away. Which leads me to the conclusion that Eargle has a lot to offer for fans of this type of music. It’s worth checking out the samples at John Eargle’s web site: http://www.johneargle.com, where you can also learn about his other projects.